Every summer I celebrate the return of my "peach ladies" to our local Farmer's Market as if it were Christmas and they were the biggest present under the tree. The peach ladies, as I call them, are the owners of Tenerreli Orchards and the peaches and nectarines they bring every week to the market are so gorgeous, sweet and juicy, it makes me want to cry. 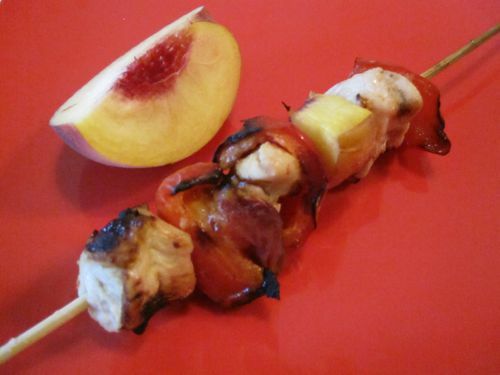 I usually buy a flat of peaches for $20 (tip: it would be $30 if I bought them by the pound so buy in bulk to save $$) and use them to make the most delicious peach gelato, peach crumble, baked peaches with honey and yogurt sauce and these scrumptious chicken, peach and bell pepper skewers. They only take minutes to prepare and Kenya loves getting to hold his own skewer and eating each ingredients off, bite by bite. Buying in bulk at your own local farmer's market is a great way to save money and enjoy seasonal produce in the months to come -- I freeze this summer's peaches for the winter so I'll be able to enjoy them all year round. 1. Place the first 5 ingredients in a large bowl and whisk to combine. 3. Add the chicken, peaches and bell pepper pieces to the marinade and toss to coat. 4. Marinate covered in the refrigerator up to 2 hours. 5. Cook skewers under the broiler or on the grill for 6 minutes, turning halfway through.